Microsoft Paint has been part of Windows for a long time. Its simple interface is ideal for creating quick paint creation without too much feature hog. Even Mac in 1984 had MacPaint, a similar application to Microsoft Paint. But it vanished from newer releases of Mac and now its nowhere to be seen. If you are missing good old MacPaint (or MS Paint) on your Mac, download PaintBrush application. It is a simple tool to create paint creations with basic feature. Its options and feature set is very similar to Microsoft Paint and you will never feel lost using this cool application. You can paste images copied from common Mac applications, including Microsoft Office and Apple iWork. You can open and work with images of commonly used formats like: BMP, PNG, JPEG, TIFF, and GIF. It has full support for transparency for image formats which support an alpha channel (currently PNGs and GIFs). 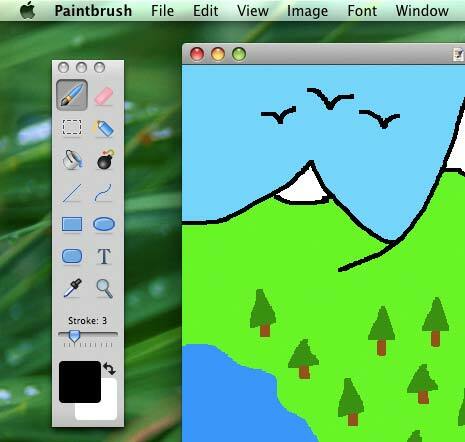 Download PaintBrush (for Mac OS X 10.5 Leopard or higher) to bring back those simple yet creative painting routine on your Mac computer.